This is Pure American Luxury: The dramatic design complemented with ergonomic luxury and innovation for both rider and passenger makes for an unmatched ride. THUNDER STROKE® 111: The Thunder Stroke® 111 V-Twin is the powerful heart & soul, delivering 119 ft-lbs of torque, tremendous acceleration & an exhaust note that is music to a real rider’s ears. ABS & CRUISE CONTROL: The Indian Chief Classic has advanced features to optimize the ride experience. With automotive-quality ABS braking, you ride with confidence that you’ll brake under control in all situations. The cruise control is easy to set & adjust so you enjoy smooth, relaxed cruising. STYLISH & FUNCTIONAL FAIRING: The stylish fairing provides wind and weather protection & features: an integrated premium audio system with Bluetooth®, electronically adjustable windshield, powerful lighting & data display screen with a wealth of operating information. KEYLESS IGNITION: Never fumble with a key again. With the key fob in your pocket, just climb on, start it up & ride. Walk away with confidence, too. The engine will only start & run when the fob is in close proximity to the bike. Misplace the fob? Just enter your personal security code and ride on. UNIQUE STEERING GEOMETRY: The Indian® Chieftain® steering geometry is engineered to deliver light, responsive handing whether this faired bike is being ridden solo with no cargo, or 2-up with full saddlebags. It delivers handling more like a sport bike than a heavyweight bagger. 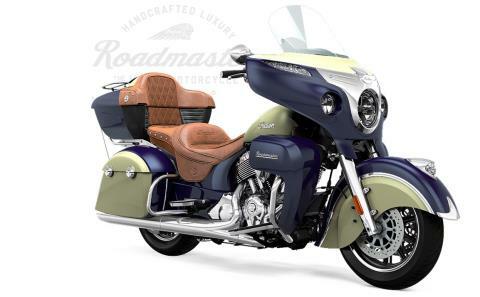 37+ GALLONS OF CARGO SPACE: The Indian Roadmaster™ has over 37 gallons of weatherproof storage in the saddlebags, trunk, fairing & storage compartments in the lowers the driver can access from the seat. The saddlebags & trunk can be locked & unlocked remotely using the key fob. HEATED GRIPS & SEATS: Enjoy all-weather comfort & extend the riding season with heated seats that have individual driver & passenger controls. The heated handlebar grips have 10 heat settings so the driver can beat the chill & ride in comfort. Rear - Cast 16" x 5"